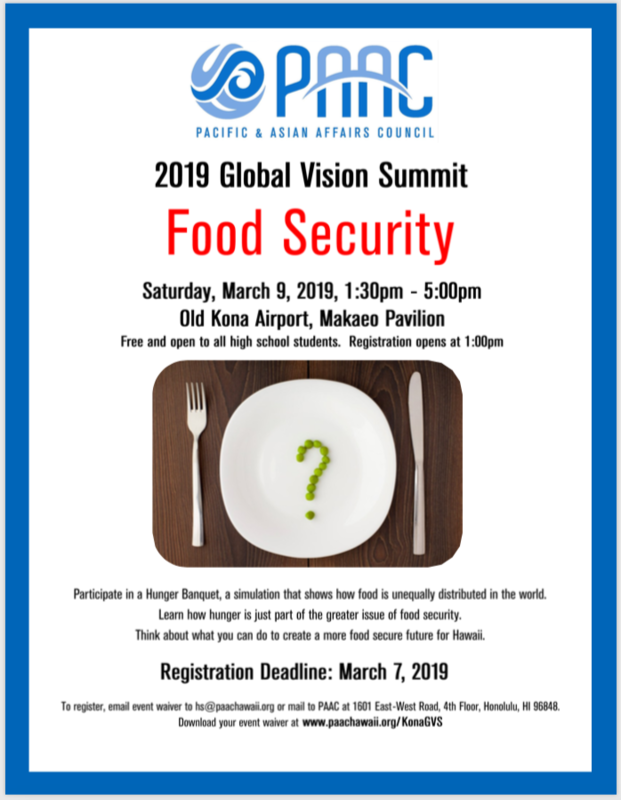 Join us for PAAC's 2019 Kona Global Vision Summit on "Food Security" on Saturday, March 9, 2019 at Old Kona Airport, Makaeo Pavilion. Free and open to all high school students. Registration opens at 1:00pm. Participate in a Hunger Banquet, a simulation that shows how food is unequally distributed in the world. Learn how hunger is just part of the greater issue of food security. Think about what you can do to create a more food secure future for Hawa'i. Download the event flyer here. Registration due March 7, 2019. To register, email event waiver to hs@paachawaii.org to mail to PAAC at 1601 East-West Road, 4th Floor, Honolulu, HI 96848.